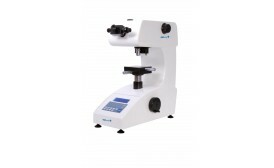 The NEMESIS 9500 is the universal hardness tester most suitable for heavy duty testing in the Eseway standard range of testers. Partly based on the technology of the NEMESIS 9000. Built for tough environments, the floor type welded frame reaches a height of 2 meters and offers a work space of not less than 650mm height and a throat depth of 300mm. Rockwell, Vickers and Brinell, but also pure depth test methods such as H, HVT and HBT are part of the standard test procedures of the NEMESIS 9500. 3 models cover a range of test loads either up to 250kgf, 750kgf or 3000kgf. The frame of the NEMESIS 9500 is equipped with a heavy duty motorised spindle, allowing positioning of the test piece on the required working height. The NEMESIS 9500 has a descending test head allowing each test piece to be tested on an ergonomic working height. The linear actuator of the NEMESIS 9500 is equipped with a load cell closed loop system guaranteeing excellent accuracy and a wide range of fast testing procedures. The test head is equipped with a 6 positions modular turret (indenters and objectives) and an optical zoom video system with 5mp HD camera. 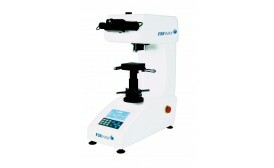 High performance PC driven automatic and manual indent measurement with automatic filing and storage functions. Refined algorithms for automatic measurement on materials normally less suitable for automatic measurement. Three years free firmware upgrade as standard. High-end Brinell testing machine. 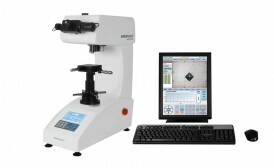 German made optical system with high quality objectives with analogue reading microscope. Conversion to other hardness scales and real-time statistics. Connectivity for data output via RS-232. Basic digital regular Rockwell type tester (CV-600BDL/MBDL) and Superficial Rockwell type tester (CV-600MBDL/S) offering accuracy, reliability and durability at an extremely affordable price. 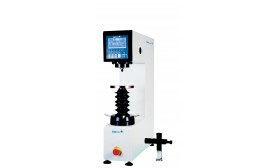 Ready-to-test digital Brinell tester with closed loop controlled load application. 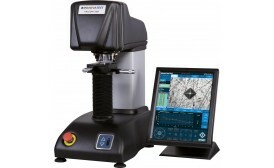 Motorised turret with digital measurement microscope, menu operated user interface. 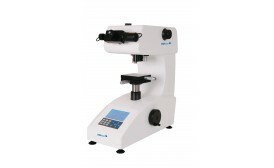 The FALCON 500 series, Micro Vickers, Vickers and Micro Brinell hardness testing machines improve conventional hardness testing methods and focus on eliminating user influence on the test results. The unique force actuator system utilizes an electronically controlled closed loop system and advanced force sensor technology to achieve absolute accuracy, reliability and repeatability, on each of the forces used for a test. 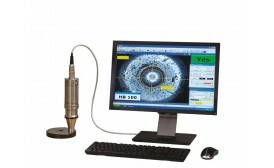 IMPRESSIONS software allows file storing, test program setting and storing, image zoom, auto focus, limit settings, conversions to other hardness scales, system setup and (remote) control, pattern testing (CHD/Nht/Rht) and widely contributes to the high reproducibility of test results. Fully automatic image evaluation combined with intuitive operator software avoid operator influence on the test results. IMPRESSIONS is the new advanced user operating system, developed by Innovatest, that will be adopted on all future developments. The software incorporates manual and automatic measurement for all scales, image editing, file storing, image storing, report printing, turret operation, manual or automatic focusing and many other advanced functions. All data can be copied or exported in to MS applications like Word, Excel, or a report generator that emails test results directly to your workstation, or server. All data can be accessed over the LAN or WLAN connections. Standard Delivery For manual X-Y stage - IMPRESSIONS software, CCD camera and C-mount included software for manual and automatic measurement of indentations, Indent zoom function, automatic light adjustment, LCD industrial DVI touch screen included (IMP-2, IMP-3, IMP-4). For motorised XY stage & auto focus - IMPRESSIONS software, motorised X-Y stage and motorised Z-axis. CCD camera and C-mount included. Software for manual and fully automatic measurement of indentations. Indent zoom function, automatic indent focus, automatic light adjustment, coordinate multi pattern testing module, motorised X-Y stage, LCD industrial touch screen included, virtual mouse function. (IMP-5 and IMP-6). 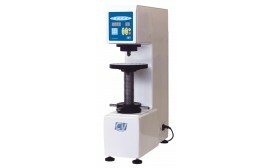 The FALCON 5000 is the most revolutionary, advanced and powerful Micro Vickers, Vickers hardness testing machine currently available. Apart from Micro Vickers, Vickers, Knoop and low force Brinell scales, configuration of the FALCON 5000 is freely definable and offers flawless upgrades to hardness testing according to standards of Superficial Rockwell, regular Rockwell & higher force Brinell hardness scales. In its ultimate configuration and most advanced version, the FALCON 5000 offers fully automatic advanced coordinate pattern, weld pattern and free style testing of metallic and plastic parts in any common hardness scale; • Micro Vickers • Vickers • Knoop • Superficial Rockwell • Rockwell • KIC fracture toughness • Brinell • HVT (Vickers depth) • HBT (Brinell depth) • ISO 2039 1 & 2 for plastics Stunning Test Force Range The servo driven testers force actuator allows test forces from 10gf up to 250kgf, currently unique on the world market. Great efforts have been taken by INNOVATEST® in designing our own ultra-precise load cells and force control electronics, that are the foundation of this new product. The load/force actuator driven by top class servo technology positions the test head at light speed and at sub-micron level accuracy, in any required position. Setting the GLOBAL Standards for Advanced High Speed Turrets The FALCON 5000’s high speed, 8 position turret, has the first in the industry, standard built in laser positioning system. • The 8 position turret also containts 2 HD cameras with autofocus and optical zoom system, allowing stage (over)viewing at indenter position • Quick change stage & anvil post • Ultra fast, dedicated system controller with i7 processor and 2 Intel SSD drives • Advanced report generator with extended CSV export functionality Quick Change Stage & Anvil Post Alternatively to the standard ultra-fast motorised CNC stages, there is the option to install larger T-slot stages, fixed stages and a number of anvils. To save time exchanging the nearly unlimited choice of stage and anvil options, the tester has another unique feature: The "Quick Change" accessories post, the tester can reconfigure in seconds. Safety First / Collision Detection System In order to ensure maximum safety for the user and to protect the tester against user errors, all FALCON models have an advanced collision detection warning and Z-Axis / test head retraction system. This system is triggered by any uncomon force on the turret and will stop and retract the test head in milliseconds. Finders, hands and work pieces are safe and there is no risk of damage to the indentors. Clamping Device An integrated clamping device will firmly hold the work piece against the anvil or test table while performing Rockwell or other depth measuring tests (optional).